Goshen, NY – The Cradle of the Trotter had some “Rolling Thunder” of its own this Memorial Day weekend as 120 motorcycle enthusiasts helped raise over $2,000 to benefit Goshen Historic Track and the Harness Racing Museum & Hall of Fame. 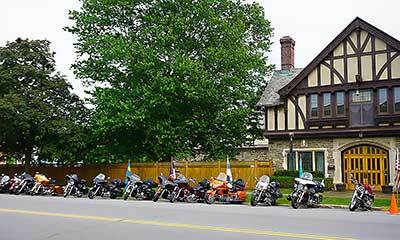 The inaugural Iron Horse Poker Run, presented by the Monticello-Goshen Chapter of the United States Harness Writers Association (USHWA), enjoyed a capacity crowd of Harley-Davidson owners and riders, who participated in a 70-mile loop around Orange, Sullivan and Ulster counties. Attendees were treated to a delicious buffet before and after the ride in beautiful Haughton Hall at the Harness Racing Museum, the hosting venue. Clubs such as the Blue Knights of New York XIV and Harley Owners Groups from Wurtsboro and Orange County also participated. Several contingents came from as far away as Pennsylvania, Connecticut and New Jersey to “ride through the Gunks.” The route also happened to pass by Standardbred nursery Blue Chip Farms, which is nestled in the shadows of the Shawangunk Mountain ridgeline. Shawn Wiles, the Chapter’s Vice President/Treasurer, as well as the National USHWA President, was equally pleased with the outcome. Door prizes from O’Tooles Harley-Davidson in Wurtsboro and the new Resorts World Casino in Monticello added significantly to the grand prize of $500 cash for the best poker hand. Having enjoyed a great turnout, along with such overwhelmingly positive feedback from the participants, the prospects of turning the Iron Horse Poker Run into an annual event are stronger than ever. The primary beneficiaries of the funds raised by the Chapter through this new affair, in addition to their annual Awards Banquet, have always been the Harness Racing Museum & Hall of Fame and Goshen Historic Track…two distinct entities that share the same hallowed ground and a mutual purpose of preserving and promoting harness racing. Matinee harness racing at Goshen Historic Track begins this weekend on Sunday, June 3rd and continues for the following two Sundays (June 10 & 17). The Harness Racing Museum is open with free admission, Tuesday through Sunday. Four days of Grand Circuit racing begins Friday, June 29, with Hall of Fame Day slated for Sunday, July 1, concurrent with Goshen’s Great American Weekend.